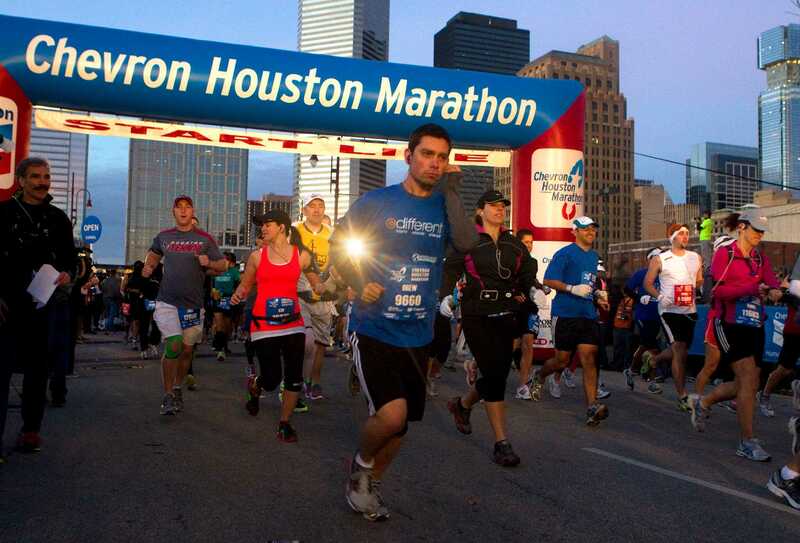 The Chevron Houston Marathon offers participants a unique running experience in America's fourth largest city. The fast, flat, scenic single-loop course has been ranked as the "fastest winter marathon" and "second fastest marathon overall" by Ultimate Guide To Marathons. 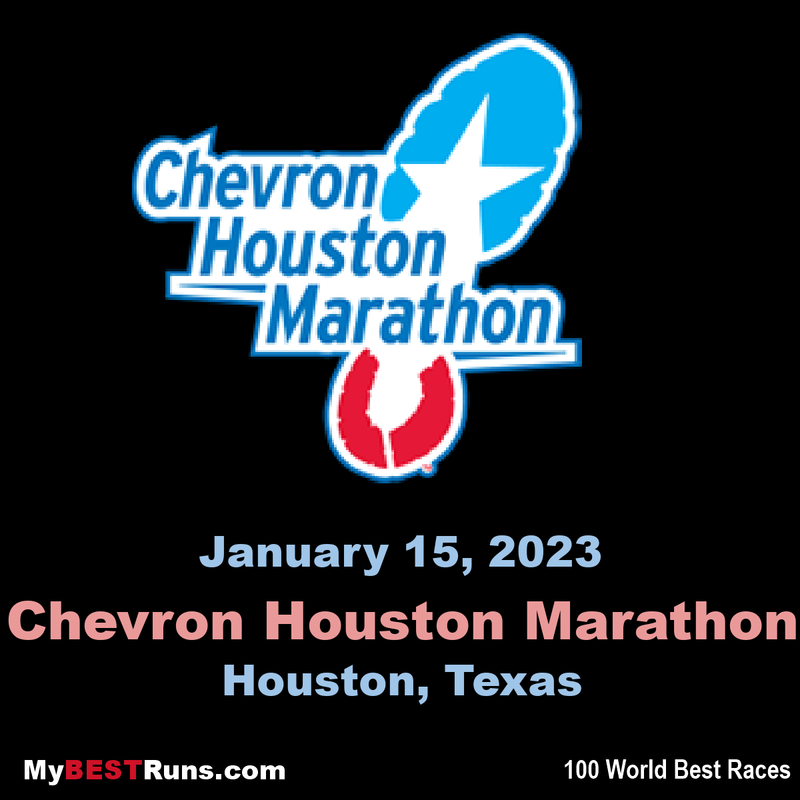 Additionally, with more than 200,000 spectators annually, the Chevron Houston Marathon enjoys tremendous crowd support. Established in 1972, the Houston Marathon Committee, Inc. (HMC), a Running USA Founding Member, annually organizes the nation's premier winter marathon, half-marathon and 5K. In 2012, more than 20,000 runners participated in three race weekend events organized by 7,500 volunteers, creating Houston's largest single-day sporting event. HMC has hosted numerous world-renowned road races, including the 2012 U.S. Men's and Women's Olympic Trials - Marathon on January 14, as well as the USA Men's and Women's Half Marathon Championships since 2005 and 2007 respectively, and the 1992 U.S. Women's Olympic Trials Marathon. They say they do everything big in Texas, and this race lives up to that reputation. I've heard many great things about this race. Wanted to qualify for Boston, but was not ready to meet the challenge. The concrete was hard on my body and the cold beer at mile 20 was more appealing than a Boston Qualifier at the time. I am sure this flat marathon appeals to those conditioned athletes looking for a PR or Boston qualifier. Ethiopian women had already created their own Chevron Houston Marathon dynasty. But Biruktayit Degefa has taken this thing a step further, deciding to corner the market herself. Degefa won Houston for the first time in her third visit in 2016, when she was 25. On Sunday, she won for the third time in four years while becoming the first woman to repeat as champion since 2010. And the one time she hasn't prevailed of late, in 2017, she crossed second, just 26 seconds back. Nor has she ever finished worse than fourth. No wonder Degefa refers to H-town as "my hometown." "When I prepare to come, I really get excited," she said. "On this occasion, I would like to thank Houston for the hospitality." We, in turn, would like to thank her for her consistent excellence, although she expressed disappointment that the personal-best 2:23:28 she posted on a sunny, chilly morning run through the city's streets from downtown to the Galleria area and back fell 14 seconds short of the course record, something she very much wants to own before she's done. "I came prepared to break it," Degefa said, "but it was colder (than I expected), and that made it difficult." Korir didn't threaten the men's course record, but he's only 24, and who's to say he won't eventually collect a head full of cowboy hats — always awarded to Houston's winners — as well in the years ahead? His story is an inspirational one. At 10, Korir lost his right thumb while chopping cow silage, and he soon quit going to school because he was routinely bullied. He wound up laboring for the equivalent of $5 a day to pay for food, never mind his running shoes. He'd never traveled to the United States before this weekend. "It's good," Korir conceded, "to win on my first time." In contrast, Houstonians who line the route have come to recognize Degefa both for her running skills and her radiance. One now-former Houstonian, Abinet Adraro, was so taken by Degefa following that first triumph that he made it a point to meet her at a dinner hosted by the local Ethiopian community. An email relationship turned into a marriage, and they split their time these days between Albuquerque, N.M., and her training grounds in Ethiopia. Adraro, to be sure, was waiting for his wife as she crossed. Also a runner, he had completed the Aramco Half Marathon in 1:02:09. Making a sixth consecutive Chevron start, Degefa seemed the strongest from the get-go in becoming the third woman to claim a (cowboy) hat trick. Veronique Marot (1986, 1989, 1991) and Tetyana Pozdnyakova (1995, 1999, 2000) are the other three-time winners. For the first 25 miles, however, Meseret Belete kept Gedefa's undivided attention, and should she deign to return in the future, it's a reasonable bet she'll claim a Stetson of her own. HOUSTON (January 14, 2018) – Exciting finishes, upset victories, American records, Olympic Trials qualifying times and personal bests highlighted a day that marked another poignant step in the city’s recovery from the devastation of Hurricane Harvey in August. In the 16th year of the Houston Half Marathon, late entrant Jake Robertson of New Zealand won in 1:00:01, the third-fastest time in race history, while Ruti Aga of Ethiopia won the women’s race in 1:06:39—not only the second-fastest time in race history, but also the second-fastest time ever run on U.S. soil. The winners each earned a first-place prize of $20,000, plus time bonuses. Huddle’s record-breaking performance means that both the men’s and women’s American records have been set here in Houston. Setting an American record in the Aramco Houston Half Marathon was Molly Huddle, whose time of 1:07:25 in finishing seventh broke the mark of 1:07:34 set by Deena Kastor in 2006. En route, she also broke American records at 10 miles and 20K pending ratification. In the 46th year of the Houston Marathon, Bazu Worku, 27, of Ethiopia came back from a 23-second deficit at 40K to win here for the third time, breaking the tape in 2:08:30. Finishing second for the third consecutive year was Yitayal Atnafu of Ethiopia, in 2:09:07. Atnafu, 24, ran the 18th mile in 4:30, the fastest of the day, to pull away from the field, and appeared to have the race in hand before fading in the final kilometers and being caught by his training partner. Worku also won here in 2013 and 2014. Finishing in sixth (2:15:52) as top American was Wilkerson Given, a local favorite, coached by Danny Green, the winner of the first ever Houston Marathon in 1972. Given was among three men running times that qualified them to compete in the 2020 U.S. Olympic Team Trials – Marathon. For the women, Biruktayit Degefa, 27, of Ethiopia won in 2:24:51 after a spirited battle with countrywoman Belaynesh Oljira, runner-up in 2:24:57. It was Degefa’s fifth-consecutive appearance here at the Chevron Houston Marathon, a streak that included a win in 2016 and a second-place finish last year. “When I come to Houston, I feel it is special joy, because I consider Houston as my hometown,” she said through a translator. “As if I’m coming to a family. I came here very prepared, and I knew that I would be winning today.” Both male and female marathon winners each earned a first-place prize of $45,000, plus time bonuses. Sarah Crouch was the top American, seventh in 2:35:22, while Hiruni Wijayaratne, eighth in 2:36:35, set a women’s national record for Sri Lanka. 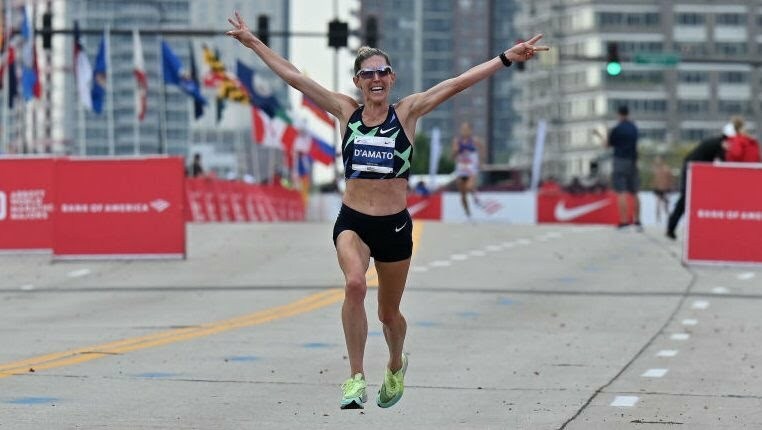 Including Crouch, seven American women qualified to run in the 2020 U.S. Olympic Team Trials – Marathon. The half marathon saw Robertson, who has lived and trained in Kenya since he was 17, pull away from Guye Adola just before 20K. He kept the hammer down through the finish, trying to dip under the magic 60-minute mark before winning in a time that tied his personal best. Finishing as top American was Sam Chelanga, sixth in a personal best 1:00:37, while Bernard Lagat, 43, set an American masters record, winning the masters division in 1:02:00 and placing 15th overall. Lagat’s time is also the fastest ever run in the world by a 43-year-old, according to the Association of Road Racing Statisticians. The women’s half marathon was both fast and deep. Before Mary Wacera shattered the event record for the Aramco Houston Half Marathon by running 1:06:29 in 2016 for the fastest half marathon ever on U.S. soil, the event record was 1:08:26. In today’s race, a remarkable seven women bettered that time, with Aga’s 1:06:39 now ranking as the second fastest ever run in this country. Asked what she would do with her prize money, Aga said she would use it to build a house. Caroline Chepkoech of Kenya was runner-up in 1:06:48, the fourth-fastest time in race history, with the next five women all breaking into the top 10 all-time here. Setting a national record for Saudi Arabia with a time of 1:26:47 was Sarah Attar, who in 2012 was among the first two women to compete at the Olympics for her country. Huddle, 33, is among them. A 25-time national champion and two-time Olympian, Huddle set the American record for 10,000 meters when she finished sixth in Rio in 2016. In November, after winning the USA 5K championships at the NYRR Dash to the Finish Line 5K, Huddle declared her intention to run here under 68 minutes, a time that would overtake Kastor’s mark. She ran with the leaders through 10 miles, but said she was worried about falling off record pace after that. The Chevron Houston Marathon and Aramco Houston Half Marathon use a single start line for both races. The start features four corrals with the first corral starting at 7:01 a.m. Corrals B and C will follow the A Corral using a pulsed start method – three minute time intervals separating the corrals – to reduce course congestion. Corral D will follow immediately after the C corral with no pulsed intervals. Corral assignments are determined by the predicted finish time of each runner indicated during registration. Corral A seeding is by request only, and the deadline to submit a qualifying time is November 30, 2018.